* With its multi-functional flap and air of ladylike sophistication, the new Diorever is the must-have bag of the season. Amidst rumors swirling about Jonathan Saunders for Dior, along with speculations of many other possibilities for a new creative director, one thing is clear: the brand is always stronger than the man. And when the brand is great, the brand will go on! This fact is evidenced by the newly launched Diorever bag, a modern take on the classic structured handbag. I’ll be getting the bag this week at the Dallas launch – and I can’t wait! Made of durable bullcalf leather, its high-tech magnetic closure flap is multi-functional. Style it tucked into the bag for open-handle ease or folded over for more ladylike appeal. Released in time for the house’s Summer ’16 collection, the obvious choice is powerful black, but it also comes in fresh shades like fluorescent goji pink, peach orange, or lemon yellow. The range doesn’t stop there. Choose among Yves Klein blue, cherry pink, neutral tapioca, or Pacific blue suede, as well as three hues of crinkled metallic lambskin. But just try not to be tempted by the crocodile editions: Hand-painted white croc? It’s almost too much to handle. Whatever the skin and color, this bag strikes the highest level of current-day sophistication, especially for someone like me, who collects vintage DIOR Haute Couture, including the original Bar suit from the ’50s. Of all the luxury brands out there, Dior has a genuine pulse on what it means to merge the old with the new, without resorting to stickers, fuzzy balls, or furry animals. Dior is forever, and Diorever is my must-have bag of the season. Available in mini 20cm, $3,000; medium 30cm, $3,400; and large 35cm, $3,900, at Dior. Certain skins, like crocodile (priced higher, of course), are only available in boutiques. …And tucked away via double magnetic closures on the back! GENIUS! This is how I like carrying mine. What do you think of the new Diorever bag? What’s the rave all about with the newest Mini Diorever Bag? Aside from the fact that it is the mini-me and cuter version of the Diorever bag, what’s more appealing to us is that it comes in different shades that could suit your personality. 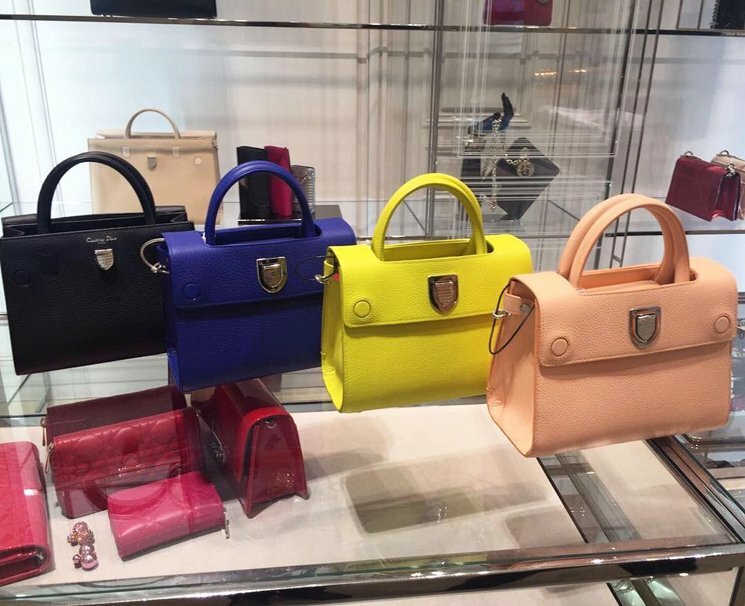 In this photo, 4 different shades of the Mini Diorever Bag is on display: classic black, bright-hued blue, playful yellow and light-toned pink. The classic black color is perfect for corporate women since it adds in-depth style to your everyday office ensemble. The bright-hued blue on the other hand stands out especially if you wear that favorite white dress of yours. The playful yellow color on the other hand add a splash of color to your monochromatic clothes while the light-toned pink adds a touch of femininity and sophistication. We sure bet it’s fun and refreshing to see these colorful bags outside while women proudly carry them on their hands. Well it might be safe to say that the Dior Fever is finally on! Jennifer Lawrence returns for the Spring Summer 2016 Ad Campaign featuring the brand-new Diorever Bag. The new Diorever bag has just been released and it’s comparable to the Diorama Bag but then in a tote-bag version. As you can see on Diorever’s front, it’s made with crest-shape closure, exactly the same as on the Diorama Bag. Besides the Diorever bag, the fashion house also presents Diorama Bags in red and silver hardware. Really nice, but what do you think? My jaw nearly hit the floor when I saw Jennifer Lawrence’s picture with that brazen yellow gold bag. Dior has produced some truly loved, staple bags like the Lady Dior, Diorama, and Be Dior. But it looks like another bag will be joining the classics league very soon! Let’s take a closer look at theDiorever Bag. The Diorever is a tote bag with a sleek, contemporary feel. Dior even describes the Diorever bag as a tote with “cutting-edge, urban attitude” and very a “strong and bold” character. It can make the perfect work tote or everyday bag that will make you feel fearlessly chic as you strut the streets. This inspiration is apparent in the bags highly-structured silhouette, sharp lines, and statement hardware. The crescent shape clasp is the bag’s focal point and is imprinted with Dior’s emblematic, signature pattern. The Diorever has a reversible flap allowing you the change up the bag’s look easily. On some styles, the interior of the flap comes with a contrasting color, which will show prominently when the flap is flipped to the back of the bag instead of clasped. The bag can be carried by hand, over the shoulder or across the body with the two top handles and adjustable, detachable strap. The Diorever is available in three sizes: mini, medium, and large. It also comes in a variety of materials and color combinations. Current styles include bull calf leather, exotic alligator leather, suede calfskin, embellished, and metallic versions. The Diorever arrives in select stores tomorrow! I’m trying to decide if I am swept off my feet because of the metallic finish or because I actually love the bag? No doubt that it has characteristics that resemble the Hermes holy grail, but I must say it has full attention at the moment. Lady Dior, Diorissimo, Diorama, Be Dior and now the Diorever – All of these names has Dior in it and they are like music in our ears. How much Dior handbags can you collect? How much do you already have in your wardrobe? There is actually one more bag that you should put on your wish list for the next season – the Dior Diorever Tote Bag. This bag is absolutely to-die-for. I would name it the Diorama Tote Bag, but Dior rather gives it a distinctive name – it’s a totally different bag, though the crest-shaped clasp might look the same as the one your recognize on the Diorama Bag…but this is a tote bag. Covered in durable leather (for now only in calfskin), completely handmade, you will love the experience. The bag comes with two top handles, the side of the flap is embellished with two (circular) buttons of which we believe is a snap-button to close the bag. So do you want to know the details?